#Secret Recipe Club: Vegan summer wrap of quinoa, black beans, hummus, corn, and tomatoes. Perfect for picnics or lunch on the go. It’s time again for our Secret Recipe Club ’reveal day’. For the uninitiated, the Secret Recipe Club is a group of around 100 food bloggers, who are separated into four smaller blogging groups. Every month, we’re each assigned a blog in our group to look through. We try a few recipes and chose one to post about. But all month long, we keep our assignment a secret until ‘reveal day’. It’s been a lot of fun – and I’ve found some great new blogs to follow and new recipes to add to my rotation. I’m always on the hunt for quick vegetarian lunches. I spend a good part of most days developing, cooking, photographing, writing about food, and frankly the last thing I’m interested in is making a big production about making lunch. Instead, I want to quickly throw something together, take it outside to the deck, and relax for a few minutes while I catch up on the local paper, before heading back to work. As soon as I saw Sarah’s recipe, I knew it would be the perfect solution. Sarah, who writes the Fantastical Sharing blog, has been the super-organized, fearless leader for our little group in the Secret Recipe Club since I started, and now she runs the whole show. If you ever want anything organized, Sarah should be on your speed dial. She serves up family friendly food on her blog that you and your kids will love. Like this Taco Twist Bake , Crockpot Chicken Fajitas, and Laughing Cow Spaghetti Pie. And for dessert – I’ve got her Peanut Butter Cup Blondies on my list to make now, as soon as I hit my target weight. It seems like the perfect way to celebrate. I switched up her fabulous Quinoa and Black Bean Wraps to make them vegan (I swapped the mayo for hummus and nixed the cheese), and took advantage of the fresh tomatoes showing up at the Farmer’s Market. But one thing I didn’t change a bit was her fabulous spicy quinoa. It’s not over-the-top spicy, but sports a bolder personality than I’ve made before, and was fabulous finished off with a squirt of lime juice. This is officially my new quinoa recipe for anything. And truthfully, I’ve made this dish twice now, and have had it for lunch AND dinner. Vegan summer black bean wrap with quinoa, black beans, hummus, corn, and tomatoes. Perfect for picnics or lunch on the go. I always rinse my quinoa vigorously before cooking it up. To do this, place the quinoa in a bowl with enough water to cover it by about one inch. Rub the quinoa between your palms vigorously in the water. The water should become cloudy from the saponin, a bitter protective coating on the seeds, being rubbed off. Repeat three times and then rinse under running water. I use a fine mesh strainer for this. Mix together the rinsed quinoa, broth, paprika, chili powder, garlic powder, and onion powder in a small saucepan over medium heat. Bring to a simmer, cover, reduce the heat and simmer for 20 minutes. You'll know it's done when the seed looks like curly-q's. Pile the quinoa into a large bowl and stir in the corn, beans, tomatoes and lime juice. Stir in the salt to taste. Spread the hummus on each tortilla, lightly cover with spinach leaves, and spoon about 1/3 cup of the quinoa mix in a heaped row, slightly off center. Fold one side of the tortilla over the quinoa and roll up fairly tightly. Use a toothpick to hold it closed. This recipe is from Sarah at the Fantastical Sharing blog, which was adapted from the Je Suis Alimentageuse blog. I totally agree with you about lunch–it has to be simple or it may not even happen! This wrap looks delicious. Happy reveal day! Lunch always seems to come at a time that I’m in the middle of a hundred things, so this was a perfect dish to make all week. I stored each ingredient in the refrigerator and then all I had to do was assemble! Yay!! I’m like you. I’m always on the looking for a delicious vegetarian recipe and I think I’ve found it with your wraps. They sound so flavorful and healthy and I have no doubt that my family would enjoy them. Thanks! They’re definitely my go-to for a tasty, healthy wrap now! Thanks JJ! This is right up your alley!!! 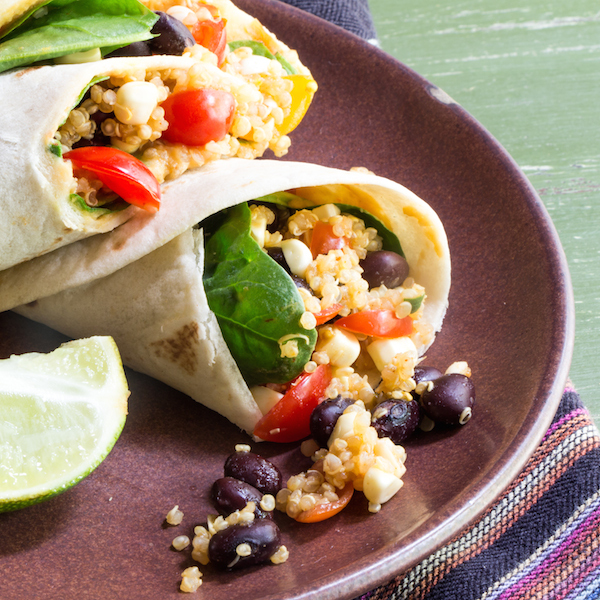 This quinoa sounds deliciously tasty, and putting it in a wrap is a great idea for a quick lunch. Love the idea of using hummus too for a vegan alternative. Super creative recipe, love the use of quinoa! What a great Meatless Monday meal. It is definitely going on my to try list. Great choice. I’m making another batch of the quinoa tomorrow for lunches this week too. You can switch it up for veggies you add to get a little variety too. I just whipped up some homemade hummus this morning, so I just wrote this recipe on our menu plan for the week. AWESOME SRC pick! Thanks so much, Dorothy!!! Our dishes make a fabulous complete meal for anyone and everyone! Hope you like it as much as we did. I finished off the quinoa last night for dinner and added chopped, raw zucchini and a dressing from smashed garlic, lemon juice, and olive oil. Killer! Hi Susan, love the wraps, great combination of ingredients. Sounds like the recipe club is a great way to really meet and follow other bloggers, how fun. It really is, Cheri. I’ve been doing it for almost a year now and have met some really nice fellow bloggers here. Think about joining us!!! You’d be a great addition to the group!!! Mexican food is always so good for dinner. I am loving the sound of adding hummus. Great pick! I am back to Europe and quinoa is cheaper here then in India so I am looking forward to try your recipe asap Susan. Thanks for sharing and hope you have been fine. The wrap looks delicious Susan. It is packed with all sorts of good for you ingredients and would be so satisfying, Great recipe! What a great idea, I could eat this wrap for dinner too. I love Sarah’s blog! These are gorgeous and look quite substantial! Yum! We’ve done something similar, but without the hummus. Great addition! Such an interesting wrap! Great pick! Yum! These look so simple and delicious! Great SRC choice! My tummy is growling! I loved these wraps when I made them – and I was really impressed with how much flavor they had. Your pictures are gorgeous! Hummus sounds like such a great addition – I need to try that when it’s just me eating it (my oldest is allergic to sesame). YUM! I hope you love the blondies when you make them – they are SO WORTH IT!! You had me at spicy quinoa. So good! These look great, high is protein, low in fat. Can’t wait to give them a try. I’ll tone the spice down a bit and my daughter will be on board. These look great! Perfect when you want a light meal. You did a wonderful job with your secret recipe assignment Susan! This is one recipe that my family will love. I love that it’s made with ingredients that I am likely to have on hand. All the more reason to try the recipe. Thanks! That looks so fresh and tasty!! What a fantastic SRC pick this month! These wraps look absolutely incredible. Another winning recipe from the Ultimate Wimp —> and I mean this in the best way possible! <3 Thanks for sharing this.